Our story began long before we met. Shortly after I moved to Alaska, I took a job in aviation at a company called MarkAir. I worked on the ramp, loading cargo and bags on to airplanes- mostly 737’s. Most of my coworkers were male. It was a very physical job, and as a woman- I knew I had to work twice as hard to look half as ‘good’ as the men. So I did. I have never been afraid of hard work. Several of the guys were pretty immature. Many were not. I made some lifelong friendships in the couple of years I worked there (1993-1995). I met one of the greatest men I have ever known during that time. He was my supervisor. He was in charge of making sure we got the airplanes turned around on time and loaded properly. Andy Mullen was his name. He was one of the funniest, warmest and most honest souls I have ever known. Andy had a way of warming your heart, and making you feel like you were his favorite person. But see- he had this affect on everyone he met and liked. (You couldn’t meet Andy and not like him. He was just full of charisma.) Andy and I became good friends. Unfortunately, the company we worked for went out of business. But Andy and I remained friends. 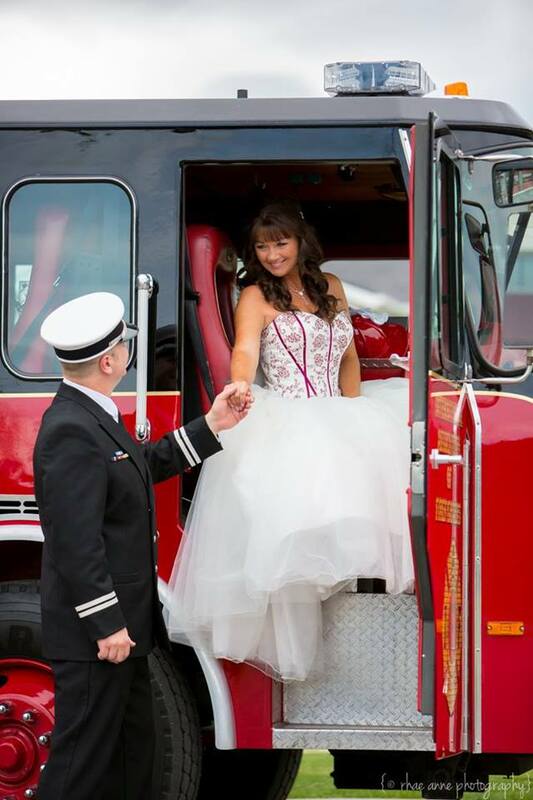 He hired on with the Anchorage Fire Department. I continued my career in logistics, working for a freight forwarder. I would see Andy around town over the years and we stayed in touch via email. In 2010, I received an email from Andy that would change everything. You see, Andy had been working for the fire department for 14 years by then. Andy wrote in his email that he had been diagnosed with cancer that he got while on the job. Andy was brave… and strong. He fought to the very end and kept up such an amazing attitude. I know he was hurting- but he never said he was. Sadly, Andy lost his battle with cancer, and died on October 11th, 2010. My heart broke. Andy left behind a wife and 3 beautiful daughters. The Anchorage Fire Department honored Andy with full department honors. There was an amazing turnout of firefighters from across the state of Alaska and a huge procession of apparatus for Andy’s memorial service. There was a group of Bagpipers and Drummers that came from Idaho to honor Andy with the rich firehouse tradition of bagpipes and drums. The Anchorage Fire Chief gave a beautiful speech, and so did three of Andy’s closest friends. One of the speakers was Clinton Powell, a Sr. Captain with AFD. He and Andy were closer than the rest of us to Andy. Their bond which was gilded through the brotherhood of fire was one that I cannot put into words. The speech that Clinton gave that day- brought the entire hall to tears as we celebrated our dear friend Andy. Andy was honored and memorialized with a plaque on the wall of The Alaska Fallen Firefighter Memorial which is in downtown Anchorage near fire station 1. I would go visit Andy at least every September and October at the memorial after his death. The Anchorage Fire Department has an annual fallen firefighter memorial- and I haven’t missed one yet. I look forward to honoring my friend every year. Andy had a Facebook page, but sadly it got taken down for some unknown reason, shortly after his death. Andy’s sister created a private group on Face book where Andy’s friends and families could go to share memories. It is there that we continue to honor Andy. We have all stayed in touch through the last couple of years. In 2012, I had an idea to create a t-shirt in Andy’s honor- and a bunch of his friends from the group participated in the order. It was a pretty cool shirt. Clinton Powell was in the Face book group. I saw him post some memories of Andy from time to time. I heard from Clinton Powell in an email that he wanted to buy one of the t-shirts. He procrastinated in contacting me though, so by the time he made contact- I had no shirts remaining. We exchanged a few emails and communicated about getting together for coffee to meet face to face, and talk about our old friend Andy. Well- I already told you that Clint is a procrastinator, and now I shall tell you that so am I. Six months later in June of 2013, I received an invitation from a Battalion Chief with The Anchorage Fire Department to discuss a line of firefighter safety accessories that I sell. I headed down to AFD station 1 for the meeting. As I sat down across from the chief, he mentioned to me that he had invited Sr. Captain Powell from AFD station 12, because at that time Sr. Captain Powell was in charge of purchasing tools for the entire department and his chief thought it would be good for him to see and hear my presentation. When Sr. Captain Powell joined us at the meeting, I knew his name and recognized him from the Face book group as Andy’s friend, who I had never actually been introduced to until now. I began my presentation. The meeting went well and after about 30 minutes, Sr. Capt. Powell said he needed to return to his station, but thanked me for coming and for introducing him to the products I had. As he turned to leave- he paused and looked at me. He then said “We still haven’t connected for that cup of coffee we have been talking about. Would you be interested in meeting me for coffee when I get off shift in the morning?” I calmly responded that yes I would, so we planned to meet at our favorite coffee spot at 9:30 the following morning. Sr. Captain Clinton Powell and I met for coffee on a sunny summer Thursday morning. On that day, my life was changed. Clint and I sat and talked. We spoke openly about our life experiences and how much we both cared for Andy. At one point I was overcome by my emotions and I shed a few tears. When Clint saw how raw the pain of losing Andy still was for me, his body language changed. He moved in closer to me and propped his elbows on his knees so that he was directly facing me, and fairly close to me. He was not in my personal space. He knew right where that boundary was- and he stayed there. I felt comfortable sharing my painful memories of losing Andy with him. It was nice to share my story with someone who loved Andy as dearly as I had, if not more so. As the morning passed us by, I told Clint that it was time for me to go. We talked about staying in touch, and he told me that if I ever needed or wanted to talk that I should reach out to him at any time. He reiterated it to me saying “I mean it. Call me any time.” putting significant emphasis on the words ‘ANY TIME’. I was immediately captivated by him. I was rattled and did my best to keep my composure. I stood to leave and he stood too. I reached out to shake his hand. As his hand grasped mine, he gently pulled me toward him and embraced me in a huge bear hug. I have never felt so safe or protected by a man and it shook me to my core. The connection that we made was nothing short of electrifying. I pulled away from him, thanked him and turned to walk away. I fought the impulse to turn back and look at him with all my will. I was not strong enough. I turned back to see him watching as I walked away. I sent him a text message later that day to let him know I appreciated meeting him and to make sure I hadn’t imagined the warmth with which he invited me to contact him again. I hadn’t. The next day (Friday) I contacted him again. He asked me if I would like to join him the following day down at the Saturday market to watch a friend of his play live music. Of course I did. I met him Saturday and we enjoyed the music at the market. He took me out for lunch and a couple of cold draft beers at a local brewery. We had a great time and agreed that we would like to see each other again. A few days later, he invited me to his house. He was doing some painting, and I went to see him. It didn’t take long for us to agree that we enjoyed spending time together, and that time apart wasn’t very enjoyable. We have been together ever since. We spent the rest of the summer and then the winter sharing beautiful adventures. Whenever we go downtown- we park at fire station 1 so we can visit Andy at the Alaska Fallen Firefighter Memorial on our way to or from wherever we are going. Each time we go to visit our friend Andy, Clint shares another Andy story with me. I love his stories. They are always so relatable that I can nearly feel Andy there with us. It is a very special spot for us. Today is Valentine ’s Day. Clint was scheduled to work today, so we planned to celebrate our first valentine’s day yesterday, on February 13th. We had plans to go out of town and stay at the Alyeska resort. We were going to go snowshoeing or hiking and then have dinner at the Double Musky. Before we could get out of town, I was scheduled to go to Brandon’s school for his parent teacher conference. The conference didn’t go so well so as a result, I was pretty upset. To top it off I wasn’t feeling very good yesterday. So after the conference I came home to meet up with Clint. We began to prepare to head out to Girdwood for our Valentine’s Day adventure. Clint came in to our bedroom and sat on our bed. He could see that I was upset, and asked me to tell him what was wrong. I climbed up on our bed next to him and explained why I was upset. He knew I wasn’t feeling well also, so he asked if I would rather postpone our Alyeska trip and just stay at home with Max and the kitties. I melted into his arms and told him that it sounded like a really nice idea. So he got up and made some phone calls and rearranged our plans. We made reservations at Simon and Seafort’s for dinner instead. (It’s a really GREAT restaurant here in Anchorage.) As we were driving to dinner last night, Clint mentioned that he wanted to go visit Andy at the memorial after dinner. He mumbled that he needed to ask Andy something. I told him it sounds great. I always love our visits with Andy. Dinner was amazing. The restaurant overlooks the inlet, and it was a gorgeous blue sky. The inlet is frozen but there was a fresh layer of snow that made everything look beautiful. We saw a lovely sunset and had a fine meal. We finished up dinner and dessert, and headed out to the memorial. The moon was 99% full last night. It was cold and clear, about 9*f. There was a slight North wind, so the flags were furling nicely at the memorial. We each grabbed an empty grocery bag out of the truck before approaching the memorial. We usually find some trash as careless folks leave trash behind, or debris that is blown there by the wind. We stuffed our empty bags in our pockets and got out of the truck to go see Andy. I stopped at the plaque of Frances C. Allen, a US Army veteran who was killed in a fire in Sitka, Alaska on October 12th, 1941. His plaque is special to me. Then we moved on to the memorial statue and said our prayers to the fallen. We then approached Andy’s memorial plaque. We stood in silence for a few minutes, quietly honoring our friend. Clint started to speak then, and I was prepared for another great Andy story. But Clint was not telling me an Andy story. Clint said “I came here to ask Andy something, and I have. He said that I should give you this.” Clint handed me a small square black box with a shiny silver bow on top. I was delighted like a little girl, and began to open the box, imagining a beautiful pendant or bracelet inside. It was cold out, and as my chilly hands fumbled to get the top off the box, I caught my breath as I saw Clint drop down to one knee and remove his hat. We clung to each other tightly there on the cold bricks of the memorial- and we stayed there for a long time. We kissed and hugged and my knees began to freeze and my teeth began to chatter. I didn’t care, because I wanted to breathe in that moment, and to make it last as long as we could. We got really cold, so we stood up and hugged some more. I realized that I had not actually opened the box that Clint handed me. I opened the box then and inside there was a gorgeous wedding set. I pulled my hand out of my glove and slid the ring over my finger. It fit perfectly. We looked at it as it shone in the moonlight. We both liked the way it looked on my hand and I love the way it felt on my finger. We then said goodbye to Andy and walked back toward the truck. There was no debris or trash to be collected at the memorial last night. Last night, the only thing to find at the memorial, was the greatest gift that we could share with each other, and with our dear friend Andy. We have committed to spend the rest of our lives actively loving each other. I am so happy that we changed our plans, and stayed close to home. I cannot imagine a more perfect place to accept Clint’s marriage proposal. I am the happiest girl in the world today as I reflect on the perfect night we shared for our first Valentines Day together.